The award-winning restaurant is serving a lavish dinner spread on December 24 and 25 with traditional favourites like roast turkey, along with a variety of desserts, all set in the midst of a souq-style restaurant. Meanwhile, the Christmas Day Polar Brunch brings a feast with treats for kids as well. When: December 24 and 25. Cost: Dh260 on December 24 and Dh345 the following day. Start the celebrations on Christmas Eve with a seasonal buffet, live cooking stations, roast turkey, surf and turf, sushi and roasted prime ribs. Relish Chef Naiby’s Christmas pudding and let your kids choose from the kids buffet. Plus enjoy live music and a visit from Santa. The Christmas Day brunch has turkey and pudding as well as other favourites in the buffet feast. When: Christmas Eve from 7pm onwards; Christmas Day between 1pm and 4pm. Cost: From Dh139 on December 24 and from Dh170 the following day. Book your Christmas Eve dinner at this cosy Italian restaurant to taste the traditional specials from Italy. The menu will feature fresh festive dishes from Italy so you and your loved ones can celebrate Christmas the Italian way with tried and tested family recipes. Cost: 3 selected dishes for Dh160. Free for kids up to 6 years and 50 per cent off for kids between 6-12 years. Celebrate Christmas Eve and the following day with family and friends at the Great British Restaurant will be putting on a buffet spread that will see you full in to the New Year. When: Christmas Eve dinner buffet from 6pm until 11pm; Christmas Day brunch from 1pm until 4pm. Cost: Dh185 per person on December 24 and from Dh310 per person the following day. Celebrate Nochebuena at Hotel Cartagena with a feast of food, including Cajun smoked BBQ turkey and wok seared prawn with crispy quinoa, alongside dancing that will see you through the night. Where: JW Marriott Marquis Hotel. Indulge in a festive feast at Seasons Restaurant this Christmas Eve and Christmas Day with a selection of international cuisine featuring seafood, carved glazed turkey, carved roasted prime rib, dim sum and BBQ grills. Guests can also look forward to a visit by Santa. When: December 24 and 25 at 7pm and 1pm, respectively. On Christmas Eve, head down to Local to indulge in a festive five-course set menu with beverage package options. The following day, feast on a roast brunch with all the trimmings and keep your eyes peeled for Santa. Cost: Dh99 per person on December 24 and from Dh190 per person the following day. Treat friends and family to a festive dinner at Palermo with a family style roast dinner with festive background music that will put you in the Christmas mood. There are kids’ activities as well. Cost: From Dh165 per person, children; Dh85 for children between six and 11 years. Free for kids below five years. Cost: Dh299 per person and half off for children between the ages of 6 and 12 years. The Christmas menu is available for lunch and dinner, with dishes including fresh lobster salad, veal tortellini and more. There’s also slow roasted turkey with ash potato. When: Christmas menu from December 24 to 26, from 12pm until 5pm. Four-course set festive menu including traditional sharing mezzeh, kebabs, kofta, shish taouk and more, all complemented with Lebanese desserts. Gather your loved ones and get in the festive spirit for a seasonally themed buffet. Featuring a traditional turkey carvery alongside dishes from around the world. With live entertainment from the in-house band and fun activities for the kids. When: December 24 from 6.30pm until 11pm; Christmas Day from 1pm until 5pm. Price: Starting at Dh169 on Christmas Eve and Dh220 the following day. As the anticipation of the big day starts to build up, head to a festive carvery at Ranches Restaurant. A lavish helping of turkey, a live duo’s festive tunes and the warmth of your friends and family will create the ambience of a traditional festive celebration. Cost: Dh285 for adults and Dh170 for kids. The Festive Churrasco Experience Guests runs across two days at the Brazilian steakhouse, which includes unlimited premium cuts of meats, a gourmet market table, authentic gaucho features, desserts, and holiday cheer. When: From 7.30pm to 11pm on December 24 and from 12pm to 4pm on December 25. Cost: Starting at Dh299 per person. Guests can enjoy a British Christmas with a festive celebration of Gordon Ramsay’s signature dishes including the turkey wellington. Helmed by Chef de Cuisine, Cesar Bartolini, the festive menu consists of contemporary British dishes with influences from Europe and beyond. Cost: Dh260 per person for a set menu on December 24 and Dh450 the following day. Savour international fare with a buffet brimming with all the festive favourites including a turkey carving station, a seafood and sushi bar, as well as traditional hand-crafted Christmas desserts. As an added bonus, experience a traditional Christmas market with enticing hot chocolate, cinnamon waffles, gingerbread and more. A children’s play area as well. Right in front of the Qasr Al Bahr restaurant between 5pm to 10pm. Cost: Dh250 per person; half price for kids. Indulge in a four-course set menu prepared by the hotel’s chefs in a festive ambience, set against the shores of Al Hamra Beach. Cost: Dh295 per person, inclusive of a glass of bubbly. Emirates Palace Christmas Day brunch will feature foods from all around the world and there will be sweets fore young and old. Cost: From Dh450 per person. The award-winning venue that overlooks a beach will also serve brunch on Christmas Day offering live entertainment by the Zero Funk band. Guests can also look forward to a visit from Santa. Cost: From Dh380 per person. Kids between 6 and 12 years eat at Dh180; kids below eat for free. Tuck into this international buffet, while enjoying festive entertainment. The family-oriented day includes a visit from Santa and a festive-themed play area. Cost: Dh295 per person; kids between 6 and 12 years eat at Dh145. Free for below 6 years. Santa will land in the desert and head straight for the Hatta mountains for this Christmas feast. Mix and mingle over a brunch filled with traditional dishes, with surprises in store for the kids. When: Christmas Day from noon until 4pm. Cost: From Dh225 per person. The newly-opened Doors Freestyle Grill at Al Seef will be serving a special four-course festive menu, inclined towards Turkish delicacies and meats, featuring dishes such as beef sushi, beef kaymak and more. 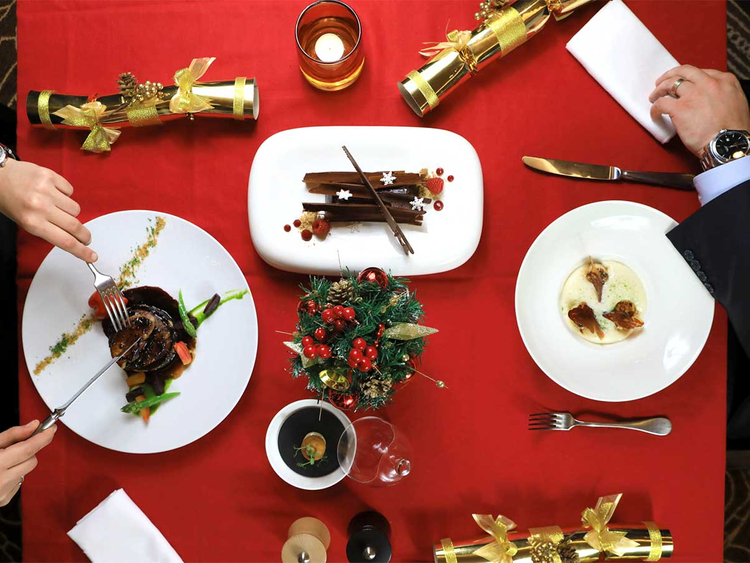 The festive menu is applicable across Christmas Eve and December 25. When: From 2pm until midnight. Cost: Dh899 for two people. Links is hosting a family festive brunch with seasonal favourites including turkey, Yorkshire and festive pudding, complete with live music, Santa’s arrival and a bouncy castle. Delights for the children also include face painting and acts by a magician. Cost: Dh450 per person including soft beverages and Dh650 per person including mixed beverages. Let’s face it, vegan Christmas lunches and dinners can be difficult to find across town, especially if you’re planning them last minute. Tub of Butter is now serving up a plant-based Christmas lunch or dinner — a vegan three-course set menu. The set menu includes mushroom soup, classic nut roast, rose and coconut mousse. Treat yourself and your family to a brunch on Christmas Day. Enter a traditional festive village set-up with special gourmet creations on offer. Indulge in traditional roasts along with international cuisine and a live band for entertainment. Little ones get to enjoy a special kid’s area with a juniors’ buffet, bouncing castle, magic show and more. The all-singing-all-dancing Christmas brunch — rat pack singer included — promises a feast with starters including pan-fried scallops, truffle burrata and seared foie gras, while for those looking for something a little more traditional, the roast butterball turkey main comes served with all the trimmings. Roast rump of Australian lamb, wild mushroom and chestnut risotto and pan-fried duck breast are just three of the other mains to choose from. Finish your meal with a traditional Christmas pudding. When: Christmas Day from 1pm onwards. Cost: Starting at Dh295. Children eat at Dh99. Indulge in this two-course Christmas menu including a selected mocktail, available all day with traditional festive turkey delicacies, BBQ meat loaf, Cajun spiced blackened salmon and stuffed bell peppers. All come served with traditional sides and your choice of dessert — mince pies included. Indulge in a Polynesian-style Christmas at Lapita with a buffet spread, showcasing everything from a Polynesian Grill serving up Cigali lobster and lamb chops to turkey carving stations with all the trimmings including traditional stuffing and Yorkshire Puddings. Finish off with a dessert spread featuring homemade Polynesian Tonga toast and fried ice cream, as well as a comprehensive cheese board. The Lapita Carol Singers will set the mood, whilse kids will be fully entertained with gingerbread house decorating, a Christmas Piñata and maybe even a visit from the big man himself. Where: Lapita, Dubai Parks and Resorts, Autograph Collection. When: Christmas Day from 1pm until 4pm. Enjoy a festive feast with a twist this Christmas at the newly opened Italian Venetian restaurant, All’onda. Serving up an Italian Christmas feast, guests can expect a three-course menu served directly to their table. Antipasti dishes include Calamari Paccheri Salad and Burrata, followed by roast turkey served panzanella with rosemary potatoes, cranberry pancetta sprouts and more. Cost: Starting at Dh400 per person. Tuck into traditional favourites whilst dancing the day away to live music and let the little ones enjoy at the kids’ corner, keeping them busy with interactive activities. Where: Le Meridien Dubai Hotel & Conference Centre. When: Christmas Day, from 1pm until 4pm. Cost: Starting at Dh389 per person. Eat and be merry with an organic feast of Latino-inspired international dishes whipped up by chef Sergio and his kitchen elves. Come geared up with your dancing shoes. Cost: From Dh249 per person. Cost: Starting at Dh700 per person including soft beverages. Kids eat at Dh450. 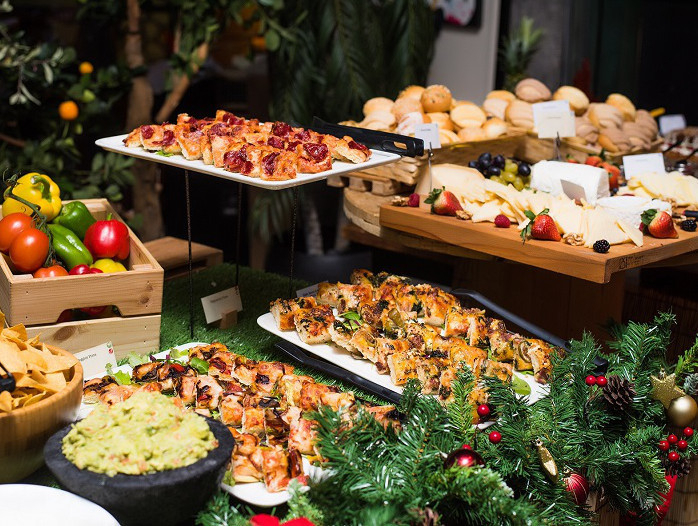 Set amid the Festive Gardens, savour a BBQ style brunch filled with seasonal favourites and signature specialities like an oyster and smoked salmon bar, a carving station and an extensive selection of desserts. From holiday-themed activities to a live band and an exciting kids’ corner, Christmas Day plans are set. When: Christmas Day from 12.30pm until 3.30pm. Cost: From Dh495 onwards. Children below four eat on the house. The rooftop terrace overlooks the Burj Khalifa and the Business Bay skyline, making for a picture-perfect Christmas after party. Classic Christmas hits to play on the decks. Indulge in an international mix of winter-inspired dishes and festive favourites at BLVD on One’s Christmas Day brunch, featuring a live carving station, festive drinks and seasonal entertainment, including a live band. Take your festivities outdoors this Christmas Day with the Urban Picnic in the heart of Downtown Dubai. Pick up a picnic basket and fill it with goodies from a family-style buffet of delicious festive fare, before relaxing at your grass-covered picnic table or outside by the pool and enjoying the mixes by the resident DJ. When: From 1pm until 5pm. Cost: Dh295 per person inclusive of soft drinks, Dh395 per person for house beverages. Children between 6 and 12 years eat at half price while those below five dine on the house. The international brunch includes a turkey carvery, Christmas-themed beverages, live music and a special visit from Santa Claus. Cost: From Dh350 for adults and Dh195 per children aged 4 to 12 years. Those living up in Ras Al Khaimah, we’ve got your Christmas Day celebrations covered. Head down to Pesto Ristorante Terrace with a live band and activities for kids.